Dame Sarah Storey says she hopes to make ‘real changes to the way people travel’, after being appointed Sheffield City Region’s first active travel commissioner. Announced on 1 April, Dame Storey, Britain’s most successful female Paralympian, will be responsible for encouraging more people in and around Sheffield to travel by foot, bike or public transport. Dame Storey said: “I believe active travel is a less stressful way of moving about and helps to create the foundation of a happier workforce and a happier population. “For me, this is about having another string to my bow, and utilising that profile of elite sport to benefit the wider population. 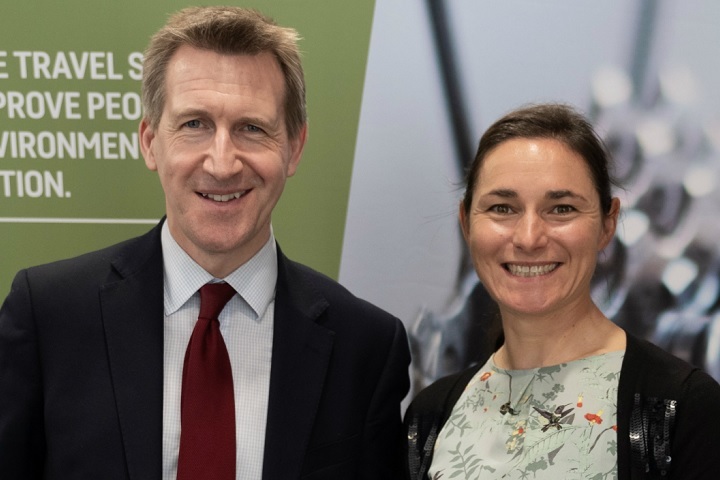 In her new role, Dame Storey will work closely with Dan Jarvis, mayor of the Sheffield City Region, who says he was inspired by the ‘fantastic’ work of Chris Boardman, Greater Manchester’s active travel commissioner. Mayor Jarvis said: “To have such an exceptional, inspirational and passionate individual leading our active travel agenda is very exciting. “Sarah joins us at an exciting time and will play a crucial role in helping us to make sure that active travel remains an absolute priority as we make our region’s transport network fit for the 21st century. “By prioritising active travel, we can improve people’s health, cut carbon emissions and reduce congestion. To mark the announcement, Cycling UK and Cycle Sheffield have published a study, outlining a shared vision for how the region’s cycling and walking levels can be improved. The study shows how ‘simple changes’ to roads could encourage more cycling and walking, while still allowing motor vehicle access. Both Sheffield City Council and the Sheffield City Region support the study, and Cycling UK hopes it will act as inspiration for Dame Storey in her new role. Ian Carey, Cycle Sheffield co-ordinator, said: “Cities should be designed around and for people, creating healthy places where children can walk and cycle safely to school. Cycle Sheffield has worked with Cycling UK to present a vision for community focussed streets. Dame Storey’s appointment has also been welcomed by Living Streets, who recommends appointing someone at a senior level to champion walking in its ‘Blueprint for Change’ – a guide for improving towns and cities for walking. Jenny Wiles, regional director (north), Living Streets said: “More people walking and cycling tackles many of our public health crises, including lethal air pollution and costly levels of physical inactivity.